Assoc. Prof. Dr. Numyoot Songthanapitak, signed a Memorandum of Understanding with The Assemblée des Directeurs d’ I.U.T. (ADIUT), France, represented by its Vice President, Philippe Pierrot. The signing ceremony took place at the Government House, presided over by Thailand’s Prime Minister Yingluck Shinawatra and Jean-Marc Ayrault, France’s Prime Minister. Comprising nine universities, The Association of Rajamangala Universities of Technology, is the first institution to sign an MoU with France’s Insituts Universitaires de Technologie (Association of Universities of Technology). The two institutions agreed to collaborate on both academic and research, particularly in the fields of science and technology, agricultural engineering, agricultural industry, and service industry. Thailand and France have signed five memoranda of understanding (MoU)on areas ranging from defence and education to research, Prime Minister Yingluck Shinawatra said yesterday. She was speaking after meeting her French counterpart Jean-Marc Ayrault at Government House. Mr Ayrault was on a two-day official visit to Thailand which concluded yesterday. 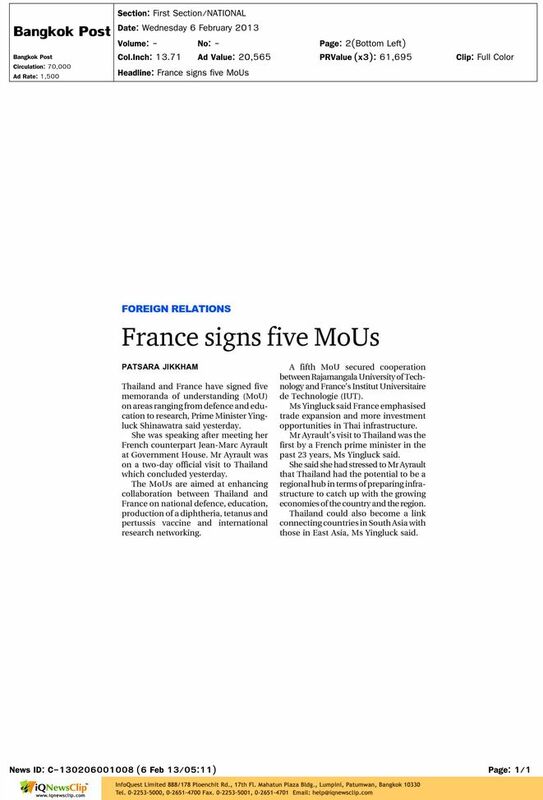 The MoUs are aimed at enhancing collaboration between Thailand and France on national defence, education,production of a diphtheria, tetanus and pertussis vaccine and international research networking. A fifth MoU secured cooperation between Rajamangala University of Technology and France’s Institut Universitaire de Technologie (IUT). Ms Yingluck said France emphasised trade expansion and more investment opportunities in Thai infrastructure. Mr Ayrault’s visit to Thailand was the first by a French prime minister in the past 23 years, Ms Yingluck said. She said she had stressed to Mr Ayrault that Thailand had the potential to be a regional hub in terms of preparing infrastructure to catch up with the growing economies of the country and the region. Thailand could also become a link connecting countries in South Asia with those in East Asia, Ms Yingluck said.